Good afternoon. After seeing off Typhoon Mangkhut, I am so glad to be here today to welcome home our Asian Games athletes, to honour athletic dedication at the highest levels, and to celebrate their excellence and unprecedented achievement. I’m delighted to repeat what we all know – that our athletes performed brilliantly, returning home from the 18th Asian Games in Indonesia with a record of 46 medals. That includes gold medals in cycling, squash, gymnastics, equestrian and rugby. 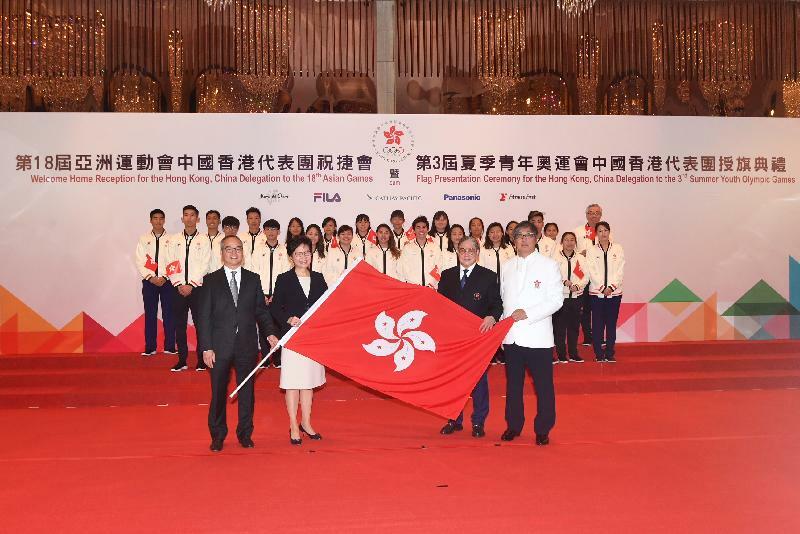 The two gold medals won in equestrian and rugby are the first ever won by Hong Kong in those events, and in many other events our athletes scored Hong Kong's best results or broke the Hong Kong records. You have all made Hong Kong truly proud, and I’m speaking of all of you. Whether you returned home with a medal or not, in our hearts and minds you are all champions and role models for the next generation of Hong Kong athletes. Indeed, in the sacrifices you made in pursuit of excellence, you are role models for all of us. My congratulations as well to the organisers, the coaches and everyone else associated with the Hong Kong, China delegation to the Asian Games. I have no doubt that Hong Kong athletes will continue to compete with excellence in future competitions. Such competitions include next month’s Youth Olympic Games to be held in Buenos Aires, Argentina. This will be the third Youth Olympics which is the world’s largest multi-sport event for athletes between the ages of 15 and 18. Our record 25 gifted young athletes will participate in nine sports. It’s an invaluable opportunity to compete in this most elite of international sports events, and I wish each and every one of you a memorable performance and an unforgettable experience. 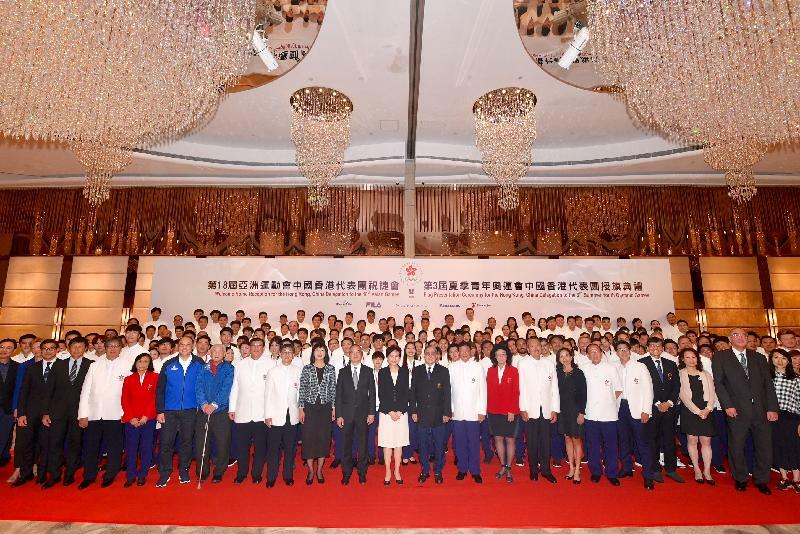 My Government will continue to support Hong Kong athletes and the development of sports. Timothy, Herman, Tony (Vice President of SF&OC, Mr Tony Yue), and some coaches and athletes will tell you that I have a good track record in supporting sports development in Hong Kong, dating back over a decade ago when I was Permanent Secretary for Home Affairs in charge of sports policy. I still remember vividly that upon my return from the 2006 Doha Asian Games with SF&OC, I announced at the Hong Kong International Airport together with Tim that the Government would build an indoor velodrome of international standard to provide dedicated facility for the training of our cycling athletes. This velodrome now stands proudly at Tseung Kwan O and has contributed to the excellent performance of our cycling athletes who won three gold, four silver and one bronze at the Jakarta Games, and provide the venue for international competitions enjoyed by the local community. So this experience tells me that dedicated training venue is very important for athletes. I know the Chairman of the Hong Kong Sports Institute, Mr Lam Tai-fai, has another plan for me about building more facilities. I can promise you people that I will give it a very fair hearing. You may say that past record is not good enough. So let me briefly recount commitments made by this term of the HKSAR Government. In my first Policy Address last October, we allocated $130 million for the launch of a five-year development programme for the relevant national sports associations to formulate and implement training programmes for Hong Kong athletes to compete in the Asian Games. We have offered funding for enhancing team sports progressively. In the 2018-19 Budget, delivered in February this year, we announced the further injection of $5 billion into the Elite Athletes Development Fund which together with the $1 billion injection in 2017, will be able to provide greater support for our elite athletes. 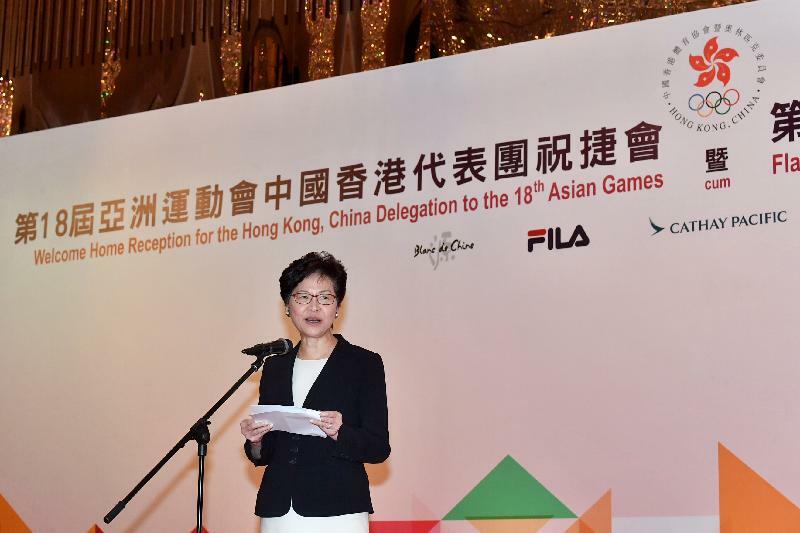 Another $500 million was allocated to launch a Major Sports Events Matching Grant Scheme to promote large-scale sports events in Hong Kong. We will continue to engage with SF&OC, the Hong Kong Sports Institute and the school sports sector to identify areas for further government support.